Full refund minus shipping costs if within 6 weeks of delivery. 1-year warranty on parts. 90 days on labor. 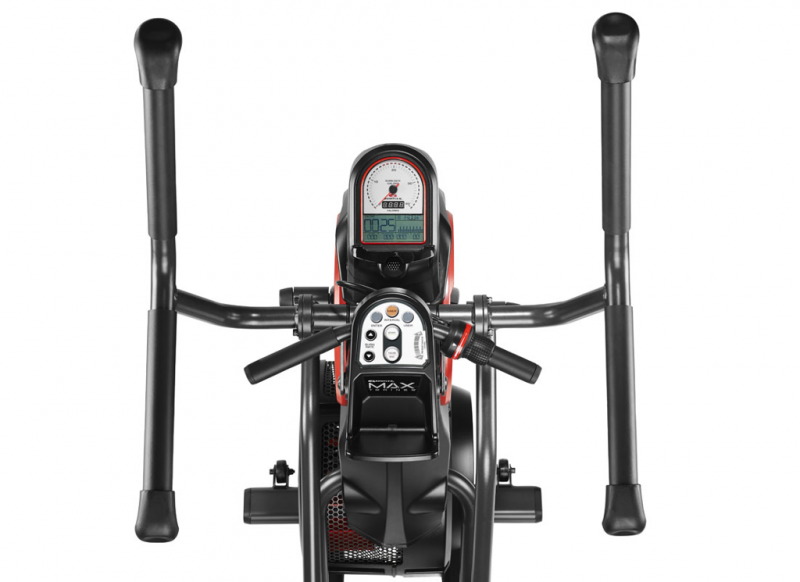 Bowflex launched the Max Trainer M3 in December 2013. This is a cardio machine that has the motion of a elliptical and a stepper. 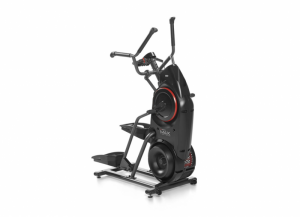 It currently comes in just under $1,000 and is the entry level model of the Max Trainer series so it doesn't have some of the premium features which the M5 and M7 sport. The Max Trainer M3 has a small footprint at 46" long by 25" wide, and 63" high. Since you travel up and down during your workout the ceiling height of the room you use it in needs to be at least your height plus 15 inches. The maximum user weight for the M3 is 300 lbs. It requires power so the included AC adaptor must be plugged in when the machine is in use. If you have used an elliptical before then you will find the Bowflex Max Trainer M3 pretty easy to use. It doesn't have the long stride of the traditional elliptical but what it does have is more of a step like motion which combined with the use of the ergonomically designed handle bars gives you a full body workout. The handles have 3 positions for your hands which allows you to tone different parts of your upper body. When using a Max Trainer it is recommended you wear shoes and not use bare feet. To start you step onto the foot pads and grab onto the handle bars. You can then select the program you want. The M3 only comes with 2 programs. The Max Interval program which is the one designed for you to burn 2.5 time the normal calories in 14 minutes. This program even on the lowest resistance setting is hard work. You need to be in decent shape to complete it. The second program is a manual one which allows you to specify your own time and resistance levels. The M3 comes with 8 resistance levels as well as a chest strap for the heart rate monitor. The main controls are on the upper control panel which allows you to turn the machine on or off, change the time, select which program you want, and to choose from 2 different user profiles. The resistance dial is integrated into the right grip which you turn to select the level you want. The back console contains the display which has a speedometer that shows your burn rate (calories per minute). On the speedometer it also shows your target zone with lights to show what rate you should be currently at. The LCD screen itself also shows how long you have been working out, your heart rate, total calories burned, distance travelled, and current resistance level. Standard delivery for the M3 in the United States (contiguous) costs $100. It takes 2 to 10 business days to get the product ready and delivery adds about another 7 days. For an extra cost you can have the Max Trainer shipped to Alaska, Hawaii, and internationally. The assembled weight of the M3 is just shy of 150 lbs and is shipped in 2 boxes. One box contains the main body while the other has the handles, arms, foot pads, and the base. The Bowflex Max Trainer M3 is priced at $999 plus shipping and taxes. You can also pay an additional $100 to have Bowflex put the M3 together for you. * All prices are in USD unless specified other wise. Prices, coupon codes, products offered, and product features last checked February 29, 2016. Within 6 weeks of delivery if you are not satisfied with the Max Trainer M3 you can call the Bowflex Customer Service center to start the refund process. The refund does not include the shipping and handling charges. The Bowflex Max Trainer M3 comes with a 1 year warranty. All parts including the frame and electronics are covered. Labor is only covered for 90 days. For more information please read your Bow Flex Max Trainer manual for full details. For any problems you can contact Bowflex by a toll free phone number, live chat, and through email. They have a number of online videos and manuals which shows how to assemble the Max Trainer M3 and how to incorporate it into your fitness routine. Customer service is available Monday to Friday from 6am to 5 pm PST. Disclaimer: While we make every effort to ensure the accuracy and reliability of our information at Review Chatter we shall not be held responsible for any discrepancy. There is a possibility that the information provided here is outdated or wrong, please check with the companies website directly for the most recent information. As always you should read your terms of service before purchasing any product online or signing up to any online service. Is customer service knowledgeable and available when you need it? Did you get the value you expected for the money you paid? By submitting this review, you confirm that you’re an actual customer who has used this product and/or service. You are expressing a real experience and are not affiliated with the company in any way. The length of time you have used the product or service for. I had to stop running because of my knees and after a fair bit of research on the different fitness machines out there I decided on going with Bowflex and the Max Trainer, I went with the M3 as I don't need all the bells and whistles but I wanted a full body workout . I have had the machine for 2 months now and I love it. I have surprisingly lost weight with it as I was already at my ideal weight thanks to running. This machine gives a really good workout but the fan turbine does produce a bit of noise. This is fine as I always am using my mp3 player when I workout. My machine also developed a squeak. I called customer service and they told me I needed to adjust a few screws. It was the disk that needed some fine adjustment as it was hitting the side a little bit. It took me 5 minutes to fix once I got off the phone and I have been using it for 15 minutes a workout session, 5 times a week and it hasn't come back. This is a great machine and gives me the workout I want without stressing my joints. I definitely recommend it. Took a few weeks to receive my M3 from Bowflex. Louder than other machines..
All I can say is wow! Working out on a Max Trainer is sure intense when you use the actually Max Trainer program. I have tried treadmills and ellipticals in gyms which are good but after I tried my friends Max Trainer, he bought the M5, I had to get one. I wanted something that would give me a great aerobic workout in the shortest amount of time and I haven't found anything else that beats the 14 minute time of the Max Trainer. Now to be fair it took me almost 2 months of working out with the M3 on the manual settings before I was able to do the full Max Trainer program but I am glad I did buy it. The machine is solidly built and it's no worse for wear after 5 months of intense use. The rollers by the pedals did develop a bit of a squeak maybe 3 months in but a bit of silicon spray silence the noise and I haven't heard it since. I also like how small the max trainer is. Instead of taking a lot of floor space it stands up more which is ideal for me in a condo where my space is at a premium. My only real complaint besides wishing it was a bit cheaper is that the M3 needs more workout programs. Especially at the beginning when I wasn't ready for the full Max Trainer program I could have used a few easier ones. I ended up using the manual mode which is fine and also the Max Trainer mode but on super easy levels. My friends M5 Max Trainer has 8 programs I believe. I would have bought that one but at the time it was $500 more which I couldn't afford. Other models are to pricey. M3 needs more programs.